"The above pairing proved to be a big hit for composer Gian Carlo Menotti when they opened together on Broadway in 1947. The double bill ran for over 200 performances, and enjoyed similar success in London during 1948. 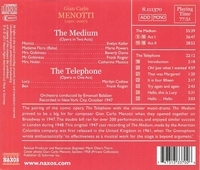 This original 1947 cast recording of THE MEDIUM, made by the American Columbia company, was first released in the UK in 1961, when The Gramophone wrote enthusiastically 'its effectiveness as a musical work for the stage is beyond argument'."